2017 | No Chic. Just Geek. Amazing. Every word of what I just wrote is wrong (to coin a phrase). This is such a wholly different kettle of fish that it’s barely recognisable as a kettle of fish at all. Jackie Chan plays Quan, a single father who owns a Chinese restaurant in London (he and his family emigrated to the UK back in the 80s). His teenage daughter is his pride and joy, and so it is an appalling trauma when she is killed in a terrorist bombing just five minutes into the movie. The bombing is claimed by the Authentic IRA, a rogue faction of the united Ireland movement, and pressure is immediately brought to bear on the political wing of the organisation to give up the men responsible for the atrocity. First in line for the squeeze is Deputy First Minister of Northern Ireland Liam Hennessy (Brosnan), who was a senior IRA man before – apparently – eschewing the way of violence. Everyone, including the media, assumes that Hennessy must know who planted the bomb, which brings him to Quan’s attention. So, yes, this is absolutely not a comedy film. Instead it is another of those Bus Pass Badass movies, this time starring everyone’s favourite Hong Kong-born knot of scar tissue in an entirely serious role. Well, I say ‘entirely serious’, but the film does require you to accept that Quan – who it turns out had some kind of special forces background during the Vietnam War – has kept up with his training over the last forty years. It’s a fairly big ask, but not an unreasonable one, as seeing Chan do his stuff is partly why you’re watching the movie in the first place. The film is, shall we say, carefully constructed so that Chan does not have to participate in a great many complex dialogue scenes in English, but his performance as a man who has basically had his emotions ripped away by an inconceivable tragedy is entirely believeable. Also operating very much against type is Pierce Brosnan. Now, it may be that one of the reasons why this film didn’t get a theatrical UK release is that it ventures into some slightly ticklish areas – I don’t just mean the fact that this is essentially a fairly lightweight thriller which features multiple bombs going off in public areas, either (I’m never very comfortable when terrorist atrocities are treated as the stuff of genre entertainment, but maybe that’s just me). Brosnan’s choice of beard, glasses, and accent makes it pretty clear that his character is intended to be a kind of roman a clef version of the Sinn Fein leader Gerry Adams, and one suspects that lawyers had an interesting time ensuring this movie was not actionable – there are numerous mentions of the IRA throughout, but references to Sinn Fein itself are much less frequent and oblique. 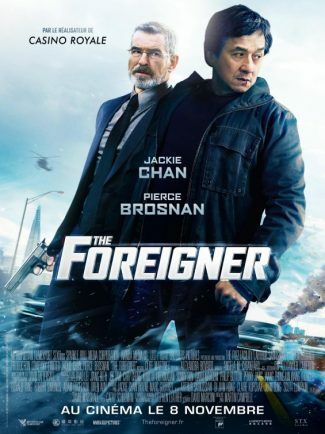 Once you get your head around all this, though, Brosnan also gives a perfectly good performance in a somewhat tricky role – Chan is obviously the good guy in this movie, but Brosnan is playing a much more ambiguous figure, whose exact role in the plot is not immediately clear. The two of them have very little screen time together, though, which is a bit of a shame. In fact, this rather feels like two quite different films which have been spliced together – there’s a morally ambiguous political thriller about Ulster politics and the connections between politicians and the men of violence, starring Brosnan, and then there’s a much more straightforward action movie with Chan in the lead role. I have to say I would have appreciated perhaps a little more of the latter, for the action sequences are where The Foreigner really comes to life – the film is puttering along engagingly enough in its opening section, then a bunch of IRA heavies turn up to Quan’s B&B to run him out of town, and suddenly we’re into a proper Jackie Chan action sequence with people flying out of windows and tumbling down flights of stairs. It’s a little more restrained and has a harder edge to it than you might expect, but it’s still exhilarating stuff. In the end, though, this is still quite a dark film – apart from Quan, there are no significant good guys, and the British authorities are depicted as every bit as ruthless as their terrorist counterparts (we see prisoners tortured and executed). At the conclusion, there is a definite sense of closure, but not really that of a happy ending – the dead stay dead, no matter what, and no-one has come out of these events unscathed and untainted. It’s an unusual and downbeat note on which to end, but one entirely in keeping with the tone of the rest of the movie. This is a pretty decent thriller, once you get past the apparently peculiar casting choices for the two lead roles, and the two stars deserve credit for trying something different and working so hard to ensure it succeeds as much as it does. You usually know what you’re going to get when you watch a David Ayer movie; he’s that kind of film-maker. It’s going to be about guys, being masculine together, usually under trying conditions. Even when there are women in the film they basically act fairly masculine too. It may be that the guys in question are cops (as in Training Day, or SWAT, or End of Watch) or the crew of a tank (as in Fury) or super-powered mercenaries (as in Suicide Squad) – the general emphasis of things is more or less the same. Given that Ayer seems to be a reliably safe pair of hands, with several LA-set cop movies under his belt, you can understand why one of the world’s leading film and TV streaming companies (the name of which rhymes with Get Clicks) would get him on board for its most ambitious original project yet, which is yet another LA-set cop movie. Albeit one with a pretty big difference, as we shall see. The movie in question is called Bright. Will Smith plays Daryl Ward, a somewhat careworn Los Angeles beat cop, coming back on duty after being shot in the line of duty. He blames his injury largely on his inexperienced partner, Nick Jacoby (Joel Edgerton). Ward doesn’t want Jacoby as his partner, but is uncomfortable with the openly racist attitudes of the higher-ups in the LAPD towards the rookie – for Jacoby is the first Orc to serve as a police officer in the city. Yup, this is one of those movies. 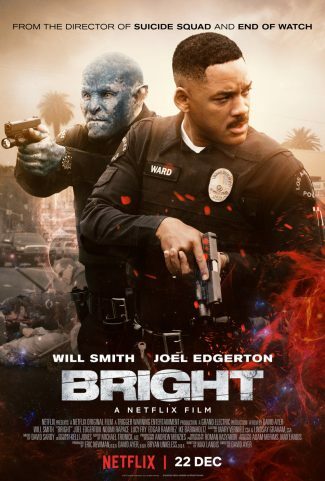 Bright‘s version of the USA is truly multi-racial, with Humans, Orcs, Elves, and other races living side-by-side (there also seem to be Centaurs, Dragons, and Fairies, but the Dwarves and Hobbits seem to be being held back for the sequel). Two thousand years earlier, the Orcs served a dreaded Dark Lord in his attempt to conquer the world, which still fuels prejudice and tension in the present day. David Ayer usually writes his own movies, but not this time: Bright is from the pen of Max Landis, previously the scribe of Chronicle, amongst others (he was also involved in the Power Rangers movie, though his script was ultimately not used). I’m not quite sure what to make of the main idea behind Bright, mainly because it manages to be soaringly high-concept and yet curiously unoriginal (the Shadowrun game franchise came up with the notion of fantasy and mythological beings living openly in a modern or near-future US over a quarter of a century ago). There are a couple of other things about the script of Bright, too, and they’re both to do with the way the film mashes up pure fantasy with gritty realism. Personally, I think there’s good fantasy, where there’s some kind of thought-through underpinning to the whole thing (geography, metaphysics, history, that sort of thing), and – not to put too fine a point on it – bad fantasy, where the writer just makes up anything that takes their fancy and doesn’t worry about whether there’s any coherent basis to it. Bright is, to be blunt, bad fantasy – not just in its talk of magic wands and ‘brights’ (the gifted individuals who can use the wands), but in the simple basis of the story. It’s not just that this is a city which kind of resembles present-day Los Angeles in present-day America. We are informed it really is LA: and there are further references to places and events and things like Russia, the Alamo, and Uber. The world is wildly different in some ways and completely recognisable in others, not because this makes any sense but just because it’s the kind of movie they want to do. Also, the moment I saw the trailer for Bright I found myself thinking, ‘Hmmm, Conquest of the Planet of the Apes moment incoming’ – that being a movie with an interesting approach to genre-based social commentary, as it essentially restages scenes from the civil rights struggle with apes in the role of African Americans. The allegorical coding in Bright is, if anything, even less subtle: Orcs live in the projects, wear sports clothing and jewellery, run in gangs, and so on. Nevertheless, just so everyone gets the point, Smith gets a line early on about how ‘Fairy lives don’t matter’. The problem is that none of this sledgehammer social commentary seems to be there to any good purpose, unless Ayer and Landis really are suggesting that African Americans are physically powerful but a bit slow (etc.). I doubt that; it just seems like everyone thought this was a cool idea for a movie and didn’t worry too much about what any of it might mean, or indeed whether it made sense at all. Now, I have been quite harsh about Bright so far, and the film has generally been picking up less glowing reviews than Get Clicks might have been hoping for (this hasn’t stopped them ordering a sequel, though). However, provided you lower your expectations and put your brain in low gear, there is still some entertaining stuff going on here. Smith and especially Edgerton give rather good performances as the co-leads (whatever its failings as a piece of fantasy, Bright holds together pretty well as a buddy thriller), Ayer directs the action with his usual aplomb, and Noomi Rapace is not bad as the chief Elf villain (finally, the role those cheekbones were born for). When it’s not being ponderously serious, there are some quite good lines, such as when Jakoby tries to persuade Ward they are in the midst of prophetically-foreseen events: ‘We’re not in a prophecy, we’re in a stolen Toyota,’ Will Smith snaps back. It still takes quite a while to properly get going, and arguably outstays its welcome a little too, but hardly objectionably so. There’s definitely a sense in which Bright is still recognisably a David Ayer movie, but if anything the thing to take away from it (for the director if no-one else) is that Ayer should stick to writing his own scripts in future. 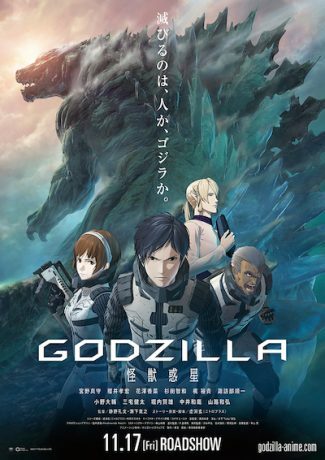 It certainly works better as a guys-in-extremis thriller than it does as an actual fantasy movie, simply because it’s all about surface, with no thought given to anything else. I get the sense that Bright exists simply because a lot of people went ‘That sounds cool!’ and thought that was a good enough reason to make to movie. The actual movie strongly suggests that coolness can only take you so far, and no further. It’s the time of year when cinemas are usually packed to overflowing with happy crowds settling down to watch epic sword-swinging fantasy adventures with a distinctly Japanese influence. 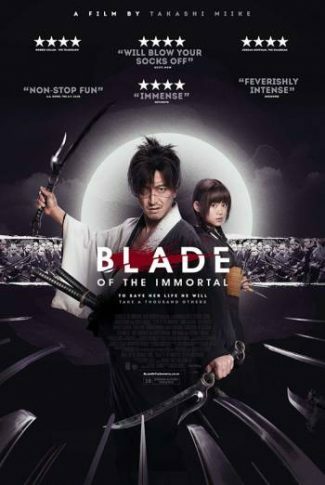 This sort of thing is a licence to print money, apparently, and so I was somewhat surprised to find myself entirely alone in a theatre watching Takashi Miike’s Blade of the Immortal, which is surely the highest-profile film currently fitting that description. Although it is actually based on a manga by Hiroaki Samura, Blade of the Immortal clearly owes rather a lot to the long tradition of Japanese samurai movies, rather in the same vein as Miike’s 2010 film Thirteen Assassins. And if I say that this is a vein which has most likely been recently slashed open and is currently spraying blood everywhere, you may get an inkling of the general tone and content of the new movie. This turns out to be Manji (J-pop idol Takuya Kimura), once a noble samurai warrior, now an aimless drifter, thanks to having life-preserving ‘bloodworms’ implanted in him by Yaobikuni fifty years earlier. In addition to stopping him from ageing, the worms also give him the kind of regenerative powers only usually possessed by Hugh Jackman. Tired of his eternal existence and deeply cynical about the world, can Rin persuade Manji to help her in her quest for vengeance? And can even Manji’s supernatural combat prowess help them overcome the many enemies standing in their way? Well, Blade of the Immortal may not be the biggest or most original movie of the year, but it’s in with a very good chance of being the most extravagantly violent. This is made very clear from the absolute start of the film – the very first sound you hear is that of a sword going through someone, and this is followed by a lengthy sequence in which Manji slaughters a vast mob of deserving opponents, getting royally carved up and losing an eye and an arm in the process (the subtitles helpfully provide ‘Ouch’ at this point). As I say, it sets the tone, and much of the rest of the film consists of either intricately-choregraphed duels between Manji and the various elite swordsmen of the Ikko-ryu (conveniently, their code of honour means they refuse to all gang up on him), or equally intricately-choreographed massed battles in which Manji and one or two other characters take on literal armies single-handed (the enemy commander is a little slow off the mark, waiting for the first two or three hundred guys to be hacked down before bringing up the muskets). If you’re looking for a film which tension in the climactic duel partly comes from wondering whether anyone involved will be able to keep their footing in the lake of gore where it’s taking place, Blade of the Immortal is the one for you. There is actually quite a clever and inventive script in the middle of all this, which does all sorts of interesting things – there are some musings as to the meaning of existence, a meditation on the futility of revenge, and the way in which the relationship between Manji and Rin is developed is also impeccable. The various references to classic Japanese action movies are also nicely done – it almost goes without saying that Kimura is giving us his take on the classic Toshiro Mifune ‘scruffy samurai’ character. However, I have to say that all this is just really very high quality dressing on a film which is primarily about people trying to chop each other up with swords, axes, pole-arms, knives on chains, and so on, and so on. And I can’t help thinking that, as such, there’s a fundamental problem with the film: it’s established early on that Manji is almost literally invincible, due to his immortality, and the question is one of how you make the film interesting and dramatically viable when your main protagonist can only ever be inconvenienced, not actually threatened. The film has a decent go at tackling this, including various grotesque fighters with supernatural abilities of their own amongst the Ikko-ryu, and this makes things interesting for a bit – there’s a battle between Manji and another immortal which is more like an update on the sequence with the Black Knight from Monty Python and the Holy Grail than anything from Highlander – but I’m not sure they ever quite solve the problem. In the end, I did enjoy Blade of the Immortal, even though it is much more thoroughly absurd and superficial than any of the Kurosawa movies which it clearly owes a debt to. But I enjoyed it much more as a spectacle, for its lavish and extravagant bizarreness and violence, than as an actual drama or action movie. It is well-made, well-directed, mostly well-acted and a lot of fun to watch – but, it would appear, just a little bit too way out there for the more refined audiences in my neck of the woods. Fair enough: this is one of those movies that will either be your cup of tea or it won’t, but if it is, you’re going to have a really good time with it. But, you know, let’s do something a bit different and try a Christmas movie for a change. I mean, it’s not as if there aren’t any Christmas films that I have time for: I like It’s A Wonderful Life (well, who doesn’t?). I like Die Hard. I like Brazil. So, there’s every chance that I could end up liking this new film, always assuming it includes one or other of an attempted suicide, blood-sodden gun battles, or delusional insanity as a happy ending. So here’s hoping. Well, anyway, the new film is Bharat Nalluri’s The Man Who Invented Christmas, a fictionalised account of a period in the life of Charles Dickens (you know, I’m starting to think those blood-sodden gun battles may not appear). Dan Stevens plays Dickens himself, who at the start of the film is making his first tour of the USA, where he is greatly feted. Quite what this sequence is doing here I have no idea, for it contributes nothing to the story; I imagine it is present only to try and sell the movie to America. Things get underway in earnest some time later, towards the back end of 1843. Dickens finds himself financially embarrassed and in need of a hit, after a number of flops in a row. So he resolves to write a book for the Christmas market which will solve all his problems. But whatever will he write about? Well, there’s a doddery old waiter at the Garrick Club called Marley, he sees a grim-faced old man muttering ‘humbug’ at a funeral, he overhears his new maid telling the Dickenslings a fairy story about ghosts, and so on. Still, it’s a tough old gig writing a novel in only about six weeks (apparently – although some of us do manage it every November), and things get a bit fraught between Dickens and his family, especially his feckless old dad (Jonathan Pryce) with whom he has Issues. (Hey! Jonathan Pryce was in Brazil, that’s a good sign.) There is also the problem that Dickens can’t come up with a happy ending – is Tiny Tim marked for death??? Hum, well. The Man Who Invented Christmas is clearly a film which has something to say about the Real Meaning of Christmas. Well, let me just stop you there, The Man Who Invented Christmas, not least because (need it even be said?) Charles Dickens did not actually invent Christmas, Christmas not being that kind of discrete, specific concept, but instead a syncretised religious and cultural event which has existed in various forms and under different names for thousands of years, with roots in traditions as widely-flung as Egyptian and Norse mythology. (Glad we got that sorted out.) The film suggests the Real Meaning of Christmas is something to do with our better selves and redemption and kindness and generosity and all that sort of thing. My experience is that this is what many people like to to tell themselves Christmas is all about, before surrendering to the warm glow of self-satisfaction this idea gives them and spending several hundred pounds on a giant TV, which they proceed to fall asleep in front of after consuming enough alcohol to power a small outboard motor. Personally, even if I had invented Christmas, I would not necessarily rush to take the credit for it. You know what, I’m starting to think I’m not the best person to give this film an objective review. Never mind, let’s press on. The basic idea of this film is not that different from Shakespeare in Love, although in this case Dickens in Debt would obviously be a better title. There’s a lot of slightly strained humour as we see Dickens pacing about his study, trying to think of a name for his protagonist, muttering things like ‘Scrunge? Scrank?’ It is a fairly well-documented phenomenon that, while films require good writing, films primarily about the act of writing are rarely good. 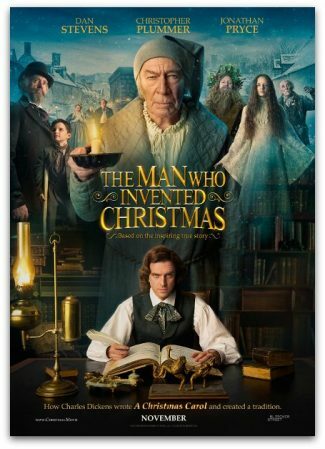 This film’s crack at the problem of how to make writing a novel cinematically interesting is to have the various characters from A Christmas Carol materialise and talk to Dickens. This does at least enable what’s indisputably the best thing in the movie, which is the appearance of Christopher Plummer as Scrooge. (Plummer has been having a bit of a Christopher Lee-type Indian Summer in his career for some years now.) You really want to see Plummer play Scrooge properly, and not engage in the underpowered ‘comic’ banter with Stevens that he is assigned here. There is, I suppose, something mildly amusing about the idea of Charles Dickens being followed around and annoyed by the cast of one of his novels, but it’s not exactly fall-off-your-seat funny, and it’s hardly a convincing depiction of the creative process. In fact, this is one of those comedy dramas which isn’t that funny and isn’t especially dramatic, either – they have a stab at some kind of psychological insight, by suggesting that Dickens can’t bear to see Scrooge redeemed until the author has himself worked through his various daddy issues, but it feels a little bit contrived. (One wonders what Simon Callow, a noted Dickens authority who appears in a supporting role, made of the script.) Certainly there is little sense of any real darkness or complexity to the Dickens of this film. The thing about a really good Christmas movie is that it does work hard to earn the happy-feel-good conclusion by going to somewhere genuinely dark and troubled on the way. This one doesn’t – it’s just slightly insipid all the way through, dramatically inert, almost aggressively bland. You can almost imagine the thought process that led to this movie being made – no-one does costume drama quite like the British film industry, and those are a good bet at this time of year. But, as there have been nearly thirty movie or TV versions of A Christmas Carol already, including ones where Scrooge has been played by a skunk, a smurf, and Michael Caine, obviously the edict was to do something different. This is a competent film in its own way, I suppose, but I just came away wishing they’d done a proper adaptation of the book, so Plummer could have played Scrooge properly. As it is, this is soft in the middle and runny round the edges, and generally about as appetising as that sounds. I’m hearing a lot at the moment that Things Are Never As Bad As They Seem and The Future Is Bound To Be Better, but even so, I can’t help feeling a bit startled by the optimisim of opening a vast new shopping centre just right now. And yet this is what someone has done: said edifice dominates Oxford city centre like a necropolis for branded goods. The sheer scale of the space seems intended to make one feel tiny, and psychologically bullied into going into a relay outlet to propitiate the trade gods with some kind of financial libation. JG Ballard would have written a novel about it; I went there to watch a movie, of course. Said cinema is on the roof of the place and is definitely up towards the luxury end of the scale – very much more a winebar than a coffee shop or sweet seller. The staff all seem terribly keen, too, although the decor incorporates different-coloured seats randomly mixed up together (which did my head in) and the place is still so new it has an all-pervading smell of paint. I was left feeling rather nauseated by this, after finding myself unable to hold my breath for the 100 minutes or so I spent watching James Franco’s The Disaster Artist. Speaking of optimism and pessimism, success and failure, I am struck by the fact that, for all that Hollywood loves making films about the movie business, there are very few films about the making of genuine classic movies. No fictional accounts of how The Godfather came to be, or Lawrence of Arabia, or 2001 (yes, obviously there may be a mileage differential here). On the other hand, they did a movie about the origins of Plan Nine from Outer Space (this seminal production is covered in Tim Burton’s Ed Wood) and a film has now appeared about how Tommy Wiseau and Greg Sestero overcame the drawbacks of having no discernible talent or experience and made what’s generally considered one of the worst movies of the 21st century, The Room. The Disaster Artist opens with a sort of ho-ho-ho-ironic-sensibility sequence in which various hip and cool folk come on and talk about their admiration for The Room – one of them is JJ Abrams, who is on very thin ice when it comes to mocking other people’s films, if you ask me. Hey ho. Suffice to say this initial sequence gives the impression that there’s a central joke here which you really have to be in on to fully appreciate the film. This does not last, however, as the story gets underway and we meet Greg (Dave Franco), a keen wannabe actor unencumbered by talent or presence, and Tommy (James Franco), a bizarre and enigmatic figure who looks like a vampire saxophonist and talks like a Russian Star Trek alien. An unlikely friendship develops between the two, as they bond through playing football very badly and giving impromptu dramatic recitations in crowded restaurants. Much to the concern of Greg’s family, the duo end up heading off to Los Angeles in an attempt to make it in the movie business. Greg is marginally successful, Tommy is not, and in the end Greg suggests they stop knocking on the door of an industry which seems (quite sensibly) determined to ignore them and make their own movie. Tommy duly bashes out the script for The Room, a drama about human behaviour, to star and be directed by him, also starring Greg, and co-starring a bunch of other actors who frankly have no idea what they’re letting themselves in for. But as the stresses of movie production increase, can the friendship between the two men survive? Full disclosure: I have managed to make it well into my fifth decade on this plane of existence without ever actually seeing The Room. What can I say, maybe I’m cursed. I was a little concerned that you actually do have to have seen this legendary yapper in order to really appreciate The Disaster Artist, but I don’t think this is quite the case – obviously there’s a degree of in-jokiness about the whole project, but I still found it to be a very funny and engaging movie. It is, first and foremost, a story about friendship under pressure – it struck me that there were very faint echoes of Withnail and I in this tale of struggling creative types, and the corrosive effects of bubbling resentment when your friend is more popular and successful than you are. But you’re never in doubt of the genuine friendship and affection between the characters played by the two Francos (perhaps unsurprisingly) and you never completely lose sympathy for Tommy Wiseau, regardless of how outlandishly strange and arbitrary his behaviour becomes. Normally I would suggest that James Franco goes howlingly, soaringly over the top as Wiseau, were it not for the fact that Tommy Wiseau himself turns up at a couple of points in the film to show just how spot-on Franco’s impersonation of him is. He comes across as not just heroically weird, but weirdly heroic too – if you want a career as a creative person, I suppose you do need the kind of indestructible confidence in your own talent that Tommy has here. But how can you be sure you’re not engaged in making your own version of The Room? It’s a thorny question. The Disaster Artist doesn’t worry overly about that and instead gets most of its mileage and best moments from its depiction of the making of The Room, which is basically presented as one man’s journey into creative megalomania. There are some very, very funny scenes, and Seth Rogen is good value as the bemused script supervisor attempting to act as the voice of sanity on the production. (Such is The Room‘s notoriety that various big names like Bryan Cranston and Zac Efron turn up in small roles throughout The Disaster Artist.) I share no spoilers, of course, if I reveal that the film concludes with Tommy as outlandishly enigmatic as ever and The Room on its way to becoming a genuine cult movie. I’ve been fairly unkind about James Franco’s acting at various times in the past (someone I know does not have many kind things to say about his novel-writing, either), but The Disaster Artist is a bit of a triumph for him as both an actor and a director. I’m not sure what to make of the fact that a film as good and entertaining as this owes its existence to one as bad (but still apparently entertaining) as The Room. But there you go. Obviously, the world often doesn’t make as much sense as it should. There’s a time to worry about that, and a time to go and see films, and going to see The Disaster Artist would be a pretty sensible choice.